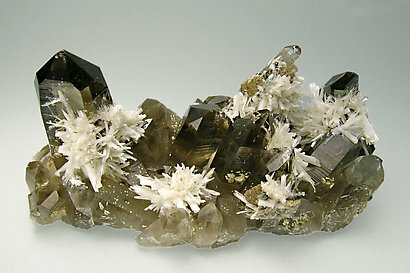 Groups of flattened prismatic crystals, very sharp, which contrast with the deep smoky tones of the Quartz crystals as a matrix. 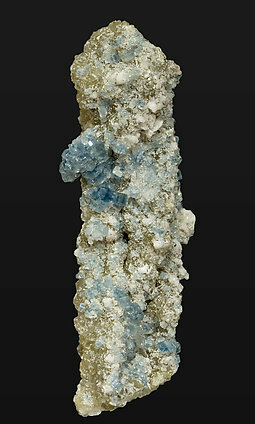 The size, definition and color of the Bertrandite crystals make this specimen very extraordinary. Aggregates of small crystals of Fluorapatite, most of them doubly terminated. The crystals are very bright and have a vivid blue color. They are with Quartz, Muscovite and crystals of Albite partially coated by small groups of Bertrandite crystals, visible under a magnifying glass, that are of excellent quality, clear, bright and many of them doubly terminated. We'll send a copy of the Bertrandite analysis to the buyer.